What it’s about: Decades ago, eccentric billionaire Oliver Ott suddenly left his empire in America to found an English-language newspaper in Rome. Now, many years later, though Ott has passed on and his timid youngest son is now publisher in name only, the paper soldiers on in an increasingly troubled time for the news media. Rachman’s episodic first novel tells the stories of those who make up the news crew, from the editor in chief to the untried stringer, the beleaguered foreign corespondent in Paris to the CFO on her way to report on finances to the board in Atlanta. Though the newsroom serves as a backdrop, the stories often focus on the personal lives of the journalists, many of whom find themselves in as dire straits as their business. The Imperfectionists is alternatively uplifting and heartbreaking. 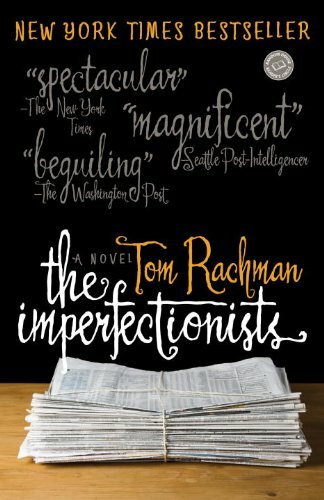 In college, I worked at a newspaper, and reading The Imperfectionists really brought me back to those days, both the good and the bad. I miss the energy of the newsroom, but also that utter conviction that what you are doing is important, that reporting means something. That ideal absolutely collided with the realities of falling reader rates and struggling ad sales, even at a weekly college newspaper. The threat of the end was present in the classroom as well. What would happen to newspapers? Were they dying? And what would that mean for society if fewer people were paid to research stories, to interview, to hunt out facts, to bring light to buried issues? There’s a protective feeling in the industry, a conviction that newspapers are needed even if they aren’t necessarily wanted. Reading this story about how the Wall Street Journal was able to compile the September 12, 2001 issue even after evacuating their offices at 9:30 AM gives me chills. Journalists are important, but those of us who feel that way often risk idealizing their struggles. The Imperfectionists has all the urgency of the newsroom, all those feelings of drive and purpose, but also doesn’t glamorize the news business. Its faults are laid bare—the struggling writer so thirsty for a paycheck he concocts a story out of one off-hand remark, the proud copy desk chief who’s devoted his life to compiling the Style Bible, the veteran stringer who is morally reprehensible but somehow always lands the best story. Even the creation story behind Ott’s paper in Rome reveals that lofty goals are less likely motivators than all-too-human emotions. Love, hate, revenge, desire—these are the things that drive Rachman’s characters. Would I recommend? Yes, especially for those who work in media or have an interest in the past and future of newspapers. Don’t be put off if that doesn’t apply to you though! A good deal of the book takes place outside the newsroom and delves into the personal lives of the characters. In many ways, it’s more a study of human nature than the news business.